Among the Windows 10 October update's many bugs, Apple's iCloud stopped working and could not be installed on the build. Microsoft and Apple had announced that they would collaborate to resolve this bug. With iCloud's newest update, it appears that this has been achieved. The Windows 10 October update, or build 1809, has been beset with problems since its release for general consumption. For example, the latest iteration has a media player bug. In addition, those who ran Apple's iCloud on devices with the October update found that this app was unusable. 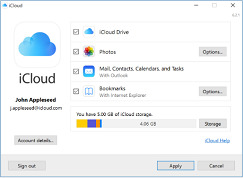 Uninstalling and re-installing did not fix the problem, as Windows blocked the re-installs of iCloud version 7.7.0.27 or earlier. However, this download block is now no longer in effect. iCloud is a program that allows an Apple user access to their files on all their devices, PCs running Windows included. The October update, however, caused compatibility issues such as the inability to sync photo albums in iCloud as normal. The latest update to iCloud (7.8.1) is now described as compatible with all version of Windows from 7 onward on Apple's download page. Therefore, the app should now install and sync as before on build 1809. Therefore, iCloud users who update to this version before trying to update Windows should find their app works fine after both are complete.